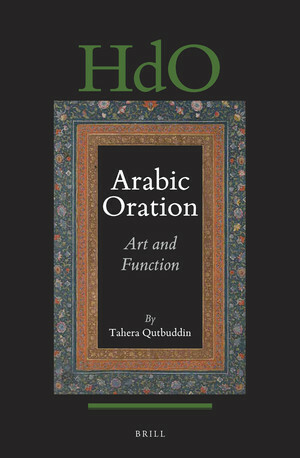 In Arabic Oration : Art and Function, a narrative richly infused with illustrative texts and original translations, Tahera Qutbuddin presents a comprehensive theory of this preeminent genre in its foundational oral period, 7th-8th centuries AD. With speeches and sermons attributed to the Prophet Muḥammad, ʿAlī, other political and military leaders, and a number of prominent women, she assesses types of orations and themes, preservation and provenance, structure and style, orator-audience authority dynamics, and, with the shift from an oral to a highly literate culture, oration’s influence on the medieval chancery epistle. Probing the genre’s echoes in the contemporary Muslim world, she offers sensitive tools with which to decode speeches by mosque-imams and political leaders today. "This erudite study is a major breakthrough in our understanding of Arabic oratory. Qutbuddin has painstakingly reconstructed this vast tradition in all its diverse guises and contexts, from the battlefield to the pulpit, from political to legislative speeches. She presents its complexities with lucid precision and scrupulous attention to detail—and it is a truly pioneering work for Qutbuddin’s discussion of women’s orations and her survey of contemporary sermons." James Montgomery, Sir Thomas Adams Professor of Arabic, University of Cambridge. "Pious sermons, stirring battle speeches, chilling political rhetoric by stern governors, splendid literary artefacts : they are the subject of this magisterial book on Arabic oratory in which Tahera Qutbuddin deals with Arabic speeches as they have been recorded in the early centuries of Islam. Their stylistic and structural characteristics, their oral nature, their function, their influence even on present-day Friday sermons in Muslim countries, all this is expertly handled, as is the controversial matter of their authenticity. This book about an important but somewhat neglected genre is essential reading for all students of early Islam, its history and its literature."